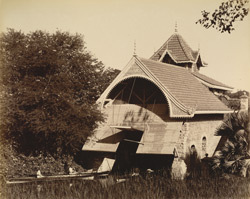 Photograph of a boat house at Baroda, Gujarat from the Curzon Collection, taken by an unknown photographer during the 1890s. The boat house is built of brick and masonry with ornately carved eaves. The location is unknown but it is likely to have been in one of the pleasure gardens in the grounds of the royal palaces at Makarpura or the Lakshmi Vilas Palace. The source of the water was probably the river Vishvamitri, as Baroda is situated on its banks.